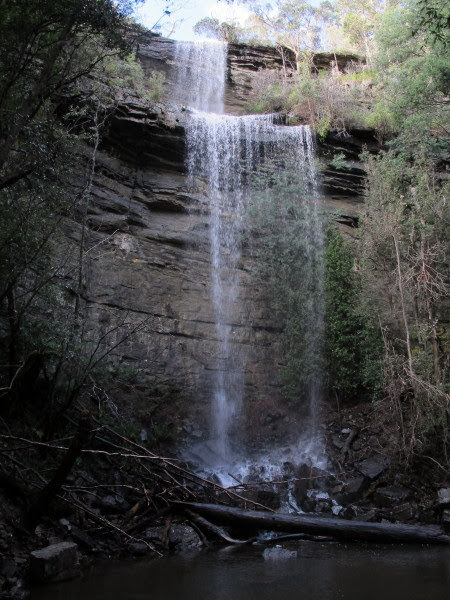 Following information that identified where floras Falls were, the incentive to make a visit was strong. The official name is Silver Falls and when we were last looking for Floras we had the intention of going to Silver Falls to check, but lost enthusiasm. It was just a short distance from where we had parked the car below Collins Cap. Prior to our walk the area had been subject to very heavy rain, causing flooding in Hobart. Now four days later there was a good flow in the creeks and Silver Falls Creek could be heard as we started to descend the steep slope of the reserve, then cascading water came into view. After 25 minutes the top of the falls and it was obvious that this was a significant waterfall, with plenty of water flowing it was in fact quite stunning. 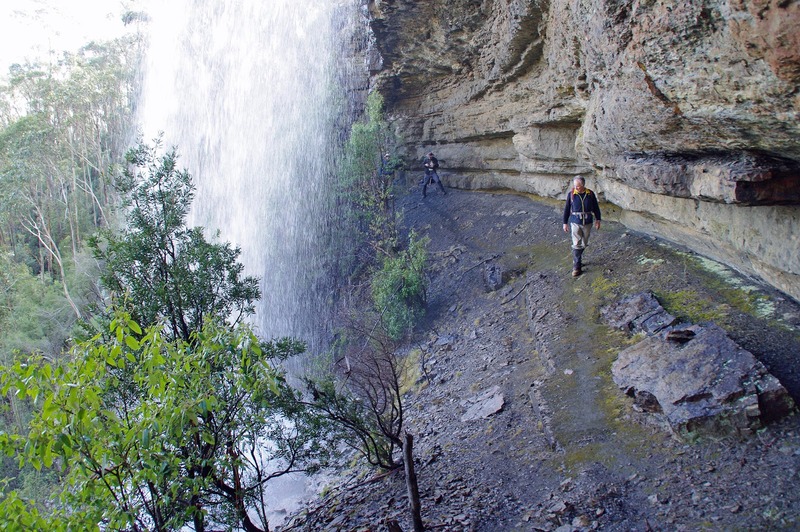 The falls are in an amphitheatre and in 3 sections totalling some 45 metres in overall height drop. He first drop has a sizeable overhang making it very easy to walk behind, whilst the second is on bands of sloping benches. It is a bit more of a descent to reach the bottom as some cliffs have to be skirted, but here the drop is the biggest and large pool lies at the base. We were all most impressed by the scenic nature of the waterfall and felt that it was deserving of more visitors. The slope in and out is quite steep, but by taking a slightly wider path to the north it would be not that difficult to create a track, although some rock would need to be used for steps in parts. The route could also be made easier by contouring more towards the cascades and crossing below them. The walk was a mere 3.2k and took a little over 2 hours. Thanks to Martin Stone for the the location of the falls. This site gives comparison photos from 1905 and 2018 together with the historical record. It's great that you found the falls but is there any need to post such detailed directions? It's hardly a safe area for people to be bush bashing and the risk of someone coming unstuck and not found for a period of time is high. It would also be nice to keep things quiet and let people stumble across this gem on their own. Have you been there and if so where did you learn about it? I've been visiting the falls for the last five years. I found out about them by chance after spotting some falls on a map. After my initial visit I did some research online and found the same information you have. It's great to see other people getting out and exploring and I guess its inevitable that word was eventually going to spread. Thanks so much for this interesting blog Peter. Unlike Paul Hutchins who complained above, I tend not to spend hour upon hour stumbling through the bush wondering if I might find a waterfall gem. I go through the bush with the intention of finding something. This looks like a wonderful place to spend a while in contemplation of the beauty of nature, and people like me can only know about it if people like you are willing to share rather than storing the treasure for your own personal and exclusive use. I can't imagine people who are not comfortable bushbashing or who are not competent at this activity would dare begin to follow the adumbrated directions.